KitMonsters – Waylayers. The music makers’ guide to making music. Waylayers make passion-fuelled anthems, and their euphoric indie pop sound has captured hearts across the world. They effortlessly fuse dance, rock and pop to create memorable tunes that are getting championed by radio DJs, and new single Medicine is storming up the iTunes electronic charts. 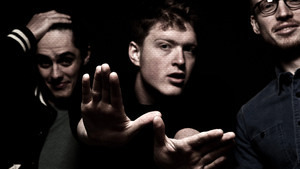 The trio - Harry Lee, Joe Andrew and Dave Norman - have played a huge number of festivals, are off to SXSW and are dab hands at brilliant DIY recording. Their debut Fault Lines EP featured in the Billboard charts. 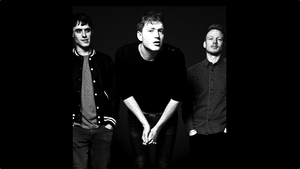 They told us how they make their music - it’s all about big sounds in a bedsit and getting people crying while dancing! 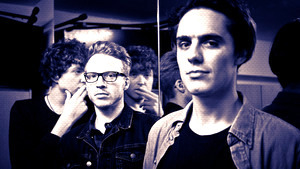 When we meet Waylayers in their rehearsal studio, they’re just back from the Isle of Wight festival and are in the middle of a big run of gigs - their sound is hugely festival-friendly and the bookings keep rolling in. Their songs really connect with the crowds, with their beats as well as their content - carefully-crafted lyrics. Harry and his bandmates say that there is a strong personal element to the songs. I guess the lyrics come from love and loss and happiness - the Fault Lines EP lots of it is all about that stuff. I guess it’s maybe cliche but we all feel it’s real. They’re all from individual experiences but I think people can relate to them. We all share similar experiences in life so you can draw upon your own. Also if you listen to the songs at different times of the day they can mean different things, which I think is quite cool. Waylayers also put out a party vibe - there are big dance elements to their music. I think we travel this weird middle ground between being a traditional band and being like a DJ, we do a bit of both. We’re constantly listening to dance music like techno and electro and trying to recreate some of the techniques that they use and bringing it into our sound. They write their music together, and recorded their Fault Lines EP in the unlikely setting of an East London bedsit! We recorded the EP in a dingy little bedsit in Hackney. The drums were done in Abbey Road for one of the songs we had called S.O.S, but we mixed that ourselves. I think there’s an element of surprise when anthemic music is made in a room that’s probably about two metres by two metres wide without much electricity that works properly - the lights don’t really work in the room! We all come at it from different angles really, we’ve all got different takes on the creative process and when they meet, they all mix quite well. I think one thing I’d say that separates us from other bands - we tend to approach the songs with the production in mind because when we’re writing songs we’re writing on Logic and recording as well, so we always have in mind what sounds we want to use and what production techniques we want to employ, and gear. The band say their music has to have soul. We want to make music that you can kind of dance to but also cry to at the same time. The passion has to come from that really, from wanting to have people dancing and really being passionate about it, and kind of writing it with that in mind. It’s almost a bit too much sometimes we sort of reel it in a bit! Waylayers were quite taken by someone’s description of a sell out show at Koko in London - that there were lots of couples kissing passionately in the crowd. We always get described as atmospheric pop music but that doesn’t really resonate with me. I want people to be emotionally connected to the songs rather than just describe the sound. We’re not sterile, it’s got to have that human aspect, it’s got to be warm, music’s about warmth. We want more people passionately kissing to our music! It’s about connecting people together and in this time of electronic hyper production it’s easy to lose that humanity within a song, with the quantizing of everything, with the auto tuning of the soul, but you’ve got to keep that in, and that’s what we try and do. Keep that in there. When we ask Harry about his sound, he tells us that Waylayers write very much together, and record their music in a pretty surprising place, considering it’s so anthemic. There is not much of a gap between their recorded and their live sound. Well I guess our music’s maybe written for those sort of environments anyway, so it’s not as difficult as it would be for other kinds of music to play in big spaces. I think we have a lot of electronica I suppose on some of the records, and live we have an acoustic drummer, so there’s a difference there, but apart from that I think it’s pretty similar to how it is on record I think. To my ears anyway. We love melody and I think the anthemic thing maybe is by definition to be made in a big space, so we love big soaring melodies in our music and they come across really well live, it really does, you know, lots of our songs people surprisingly know the lyrics. I don’t know why they do but they do, and they sing them out loud in the audiences which is nice to hear. It’s kind of what it’s all about really, the live stuff’s so much fun, the live passion. We’ve been crafting our sound in this room for quite some time and it’s nice to get out and do it on a bigger stage, in a bigger environment. I think we’re quite unique in a sense, in that we do approach it slightly differently. We’re not a traditional band, we do jam, but kind of more with soft synths, in front of a screen sometimes. Not very rock and roll but that’s the way it sometimes comes out at the moment. We’re always trying different ways so down the line it might be more of a good old-fashioned jam. 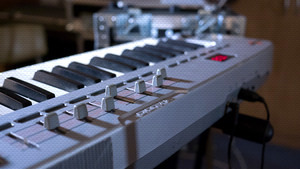 But at the moment it tends to be a hybrid of electronic ways of making music mixed with a more traditional band set up. I think there’s a space for that, you know. There’s no set formula really, we kind of approach different tracks in different ways. You know, maybe one of us will be at a piano or a guitar, I guess traditionally, and we’ll come up with a hook, a riff, and that tends to be how the process goes to start with, and then you know, we brainstorm ideas for songs, and then we’ll go and try a different sound, whether it’s with soft synths, guitar sounds, and then sort of blend them all together and add beats as well, which we tend to do in the box, in software, but again it does vary, there’s not one way of doing it. It’s good to have a formula that works, but it’s also good to push it and move that around and not stick to a specific way of trying to write music. I think that’s very important, to try and keep the creative cogs flowing. We use a lot of software. We use Apple software, we use Logic for recording, we use a lot of soft synths - Absynth, lots of the Native Instruments stuff. And we use FM8 as well, Battery, lots of different plugins as well. We use lots of different distortions, different sorts of things to bring out the harmonics, different little noises, because all that stuff adds warmth we think. There’s always this debate in music, you know, analogue versus digital and there’s a very lively debate. I guess our take on it is that you can add stuff to the sound to make it sound more analogue-y, that warmth you want to get, add distortions or noise, that can really work. Live I use another software called MainStage, I can cleverly hook in all those synths and then I’ve got a MIDI controller keyboard which triggers - I can play all the different synth sounds that we use. My vocals are pumped through my laptop and on there I have compressors and my own reverbs and you know all sorts of EQs and to be honest it’s kind of one sound that I’ve crafted for the live show, and reverbs I just add if need be. Apart from that it’s a straight signal. Kind of like, if there’s desks, the less they do to it, I can control it on my own instead, I’m just a control freak. Some artists have to change their sounds, especially now with lots of the music that’s very electronic, and they often try to put that into a live environment and it can often sound quite different, but we have that advantage in the way we do it, of it still sounding relatively similar to the recordings. We can literally take the exact sounds that we use in recording, we can use those exact sounds live. MainStage is great because you can customize how the whole thing looks, and how it’s all routed and everything, and you can really go to town on setting it up exactly how you want to set it up for your specific purpose. It’s really easy and you can load in third party soft synths, you can load in anything really, it’s just really really malleable and really easy to manipulate exactly how you want to, to get that kind of sound. I think you need that, even if you’re making the cool stuff, therefore the coolest electronica stuff, if you understand how to get your head around that stuff I think it really sets you in good stead. This keyboard’s great, I’ve had it about six years and you know, dropped it off stages by accident, I’ve spilled beer on it, I’ve lost it and found it in weird places and everything, it’s lasted me well. It’s an M-Audio keyboard, lots of the faders don’t work properly but that sort of adds to the charm I think. It’s wonderful, it’s got character. My musical inspiration comes from stuff from the Beatles through to Joni Mitchell, Fleetwood Mac, through to Swedish House Mafia or Skrillex, or you know the new stuff, I love everything, it’s really hard to quantify it in one thing, I’m always listening to new stuff. The Stone Roses are probably my favourite band of all time. Some of the early Verve stuff, the early Verve albums were amazing, and all that atmospheric, I guess shoegazy stuff was, when I was growing up that really hit me, and even bands like Slowdive, these kind of bands I used to love. I love that Chris Malinchak track that’s out now, it’s brilliant, I think that’s the best pop song I’ve heard in a long time. 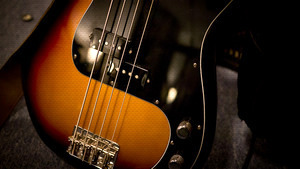 Dave told us how his bass is central to Waylayers’ sound, especially in getting people moving. It’s providing the harmonic progression in the band, but it also has to sit alongside Harry’s synths and Joe’s guitars, so essentially I’m playing the bottom end, playing along with our drummer’s kick and providing the groove and providing something for people to dance along with. His sound varies from song to song. Sometimes I want quite an aggressive sound, in which case I’ll be using a pick, which gives you a lot more definition in what you’re playing. A song like Weightless I’ll be using one, playing eighth notes all the way through, to get that kind of chuggy driving sound. On other occasions I will switch to fingers if I want to have a rounder tone with a deeper sound. So on a song like S.O.S I’ll be using fingers, which gives me a warmer sound. It doesn’t stick out as much, I’m not really playing a lead part, more sitting in with the synths that maybe Harry’s playing. Dave recently bought a new Fender bass and is really excited by it. This is a Mexican Precision Bass, bought about a month ago off eBay. I saw a great price to be honest, about 200 quid cheaper than if I’d bought it in a shop. It’s a really nice bass, it’s got a sort of punchy deep P Bass sound. Before I was using a Jazz Bass which is a lot higher, kind of more trebly, which is great for doing lead lines, if you’re playing up top. But if you want to play low and get a real thumping kind of sound, the P Bass gives a deeper sound which suits the Waylayers sound a bit more. Dave has a pared-down selection of pedals, but they are crucial for his sound. I’m going through a fairly simple pedal board into a small Trace Elliot bass amp. Most shows that I play, will have backline provided - festival shows we’re doing a lot. So it’s more about getting a sound that I’m happy with from my pedals first, because at the end of the day most of my sound is going to be coming through the monitors out front of stage and any bass amp I do have, is more just for a sound for me on the stage. So getting the right sound at the front of the stage, front of house, comes from a SansAmp Bass Driver. I’ve got the programmable version with three presets on it, but you can get the simpler, slightly cheaper version with just one preset. This pedal is essential to the sound that I want in my live set up. When you play live, normally the sound that they’re going to get out through front of house in the mixers is just going to be the simple clean sound of your bass, without any EQ, any of the nice sound of that amp, maybe with a bit of distortion coming through that natural valve sound. So this pedal gives you an XLR output on the side so you can go straight from this into the desk, so the front of house sound is going to be generated from the valves in this, because this is actually acting as a pre amp. I can get the settings I want on here, I know it’s going to sound great front of house even if I don’t have a bass amp on stage. So this is the key element to my rig. Dave also has an Electro-Harmonix Micro Pog - a Polyphonic Octave Generator. It can give you an octave above your sound as well as an octave below your sound. So you’ve got three octaves to play with here. I can add in an octave below, which is really good for stepping up a gear, in the choruses to some songs or maybe getting a kind of dubby sound, it really gives you that kind of oomph that you feel in your belly. One of my pedals is this Woolly Mammoth pedal. This isn’t the official (Z.Vex) Woolly Mammoth which costs about £250. This is a clone version I got off eBay for about 40 quid. This gives you a massive, huge wall of fuzz sound. It’s famous for Muse using it in a lot of their songs, it just keeps on going. I turn it down a bit for a slightly smaller sound which I use on one of our songs, Magnets. It gives you a sound that’s a cross between a bass guitar and a synth, which I find is really useful in our kind of music. This last pedal isn’t really going to set the world on fire with its sound, it’s more of a workhorse practical pedal, it’s a Boss Line Selector LS-2. What this allows me to do, is to blend the sound of a really extreme pedal, like the Woolly Mammoth, with my dry bass sound, so I can keep the low end of my bass and mix in a more extreme sound. I guess Peter Hook, Carlos from Interpol, a lovely sound, that’s what inspired me to first get a Jazz Bass but then I moved from Jazz to the P. Everyone loves Flea as well, though I don’t play much like Flea. 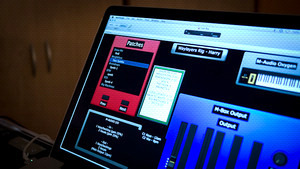 Joe creates memorable guitar riffs for Waylayers songs, as well as a certain vibe. There’s a few guitar riffs in there which are quite prominent in the song, which are providing the hook in the songs. I see myself as a rhythm guitarist, I also sing as well. But most of the time I’m providing some atmosphere and some rhythm to the tracks in general. I use a lot of reverb and delay. We’ve been described as making atmospheric pop music and I think that kind of fits. Joe’s guitar is a Strat style Samick, which he found suits him better than other guitars. He has put new pickups in to give him a wider range of sounds. It’s actually quite a cheap guitar but it plays really nicely and I think the Strats are perfect really for if you want to use a lot of effects. I used to use an Epiphone Casino, I played it for years, but I found that if you want to use a lot of effects it’s not really the best guitar to use, because there’s so much character to its sound. His effects are software based. I use MainStage on a Mac, I plug in straight to an audio interface. I use the soft pedals on MainStage, and on the master channel I use a model of the AC30 amp. I used to use a (Vox) AC30 but I found that it was far too heavy to take to a lot of the gigs that we’re playing in London, it was costing me a fortune. So I decided to use the model and for me it’s been working perfectly. I just plug straight into the desk when we play live. He told us more about his signature sound. It’s heavily reverberated - there’s two chorus pedals and two reverb pedals, basically. It sustains for a long time, it’s almost like a pad really, but it fits the sound that we want to create. I’m also using a lot of delay, like The Edge, I guess. There isn’t much hardware. I’m going through a Roland FC-30 and I’m essentially using it to scroll through the pre-programmed rigs that I’ve created on MainStage. It’s pretty simple really, if I want a new sound I press the pedal down and it scrolls down, it’s quite fluid. A lot of the sounds I’m using use a hell of a lot of pedals and a hell of a lot of different pedals and if I was to use hardware pedals I’d potentially be doing like a jig on my pedal board and be dancing on stage and I’m not a very good dancer, so I think this is the best thing for me really.